October and November 2005 saw PTWF sponsor two wonderful concerts. The first was a collaboration with the Diocese of Rockville Centre, New York, to commemorate the life of Pope John Paul II. 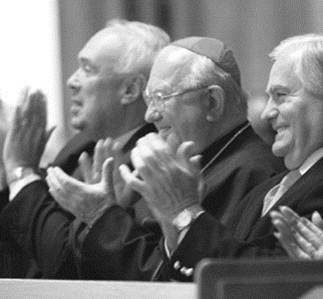 This was on October 16th, 2005 on the anniversary of the Pope's election to the Throne of St. Peter. The second concert took place in Venice Italy, where PTWF co-sponsored a multi-talented concert of classical, Jazz and modern musical artists. The event producers, Ms. Antonietta Torsello and Eugenio Masiero, spent all of their waking moments on this most important project. This event occurred on November 14,2005 in the Palazzo del Cinema on the Island of Lido in Venice. This event was the recording of the performances of over 30 talented artists in order to produce a DVD. The proceeds of the sale of this DVD will be used to benefit a hospital in Italy. The hospital, Casa Sollievo Della Sofferenza, is a 1500 bed facility which serves the people of Italy. Founded in 1956 by St. Padre Pio of Pietrelcina, serves people of every walks of life. Classical music lovers of all ages and faiths filled St. Agnes Cathedral, Rockville Centre, Oct. 16 for a presentation by the Long Island Philharmonic Orchestra and Chorus, of Fauré's Requiem in memory of Pope John Paul II's outreach to the interfaith and ecumenical community. Msgr. Donald Beckmann, top left, director of the diocese's office of ecumenical and inter-religious affairs, Bishop William Murphy and Gary Krupp of Pave the Way Foundation applaud the performance as cellist Jay Shulman, at left, performs. A special Interreligious performance of notable music will be performed at the Cathedral of St. Agnes in Rockville Centre, NY to honor the memory of His Holiness Pope John Paul II. This will be sponsored by the Diocese of Rockville Centre along with Pave the Way foundation, and a number of Jewish and Muslim organizations. This event will be televised on national religious television.